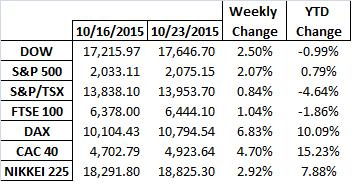 4 of the 7 indices ended in the black last week with the S&P 500 occupying the top spot at +0.90%. Last week’s worst performer was Canada’s S&P/TSX composite which recorded a drop of 90 basis points. France’s CAC 40 continues to lead the pack with an impressive YTD return of +10.06%.